We can change the way we feel by being aware of and changing the way we breathe! Join the growing breath movement. Teach people how to breathe? Too simple I thought. Let me tell you a secret…..simple is fantastic! Why do we need to overcomplicate everything? As Wild Orange evolved, I kept asking myself the same question. What is the journey I want to unfold through Wild Orange? What would I love people to be curious about? My answer, go back to the beginning, keep in simple, start with the foundations of health and wellbeing. Without a solid foundation, everything is less stable. People continue to look at me with a confused look when I explain Wild Orange starts with teaching you about breathing, about the connection between your breath and your health and learning ways to use it to live well. …And then after a workshop, they look at me differently with a kind of aha now I get it. Breathing is the foundation of our health and wellbeing. Next, to sleep, it is (in my opinion) the most important thing you can re-learn to support your mental and physical health. When I thought about my own experience with burnout and breathing, my breathing was shocking. I had zero idea how I was breathing or the benefits of breathing well. I was both over breathing (too many breaths per minute) and breathing high in my chest, exactly what I did not want to be doing! I was telling my nervous system I was in danger, get me out of here. Is it possible that I could have avoided burnt out? I believe the answer to this is a resounding yes, yes, yes. Whilst I had access to all of the tools I now use I made a choice not to use them, I didn’t think they were for me, I was so focused on building a career, a life that I naturally assumed my body and mind was happily along for the ride, only they weren’t. Breathing for health and wellbeing is gaining momentum. It may be the publications I subscribe to, the people I follow on Instagram or the events I attend but I really feel there is a breath movement happening. In the UK later this month (August 31) there is the first ever Breath Festival, every few days I see a blog post about breathing is medicine, how I used my breath to heal and so many more. I feel breathing is having it’s moment the way that yoga and meditation are now a part of our daily lives. 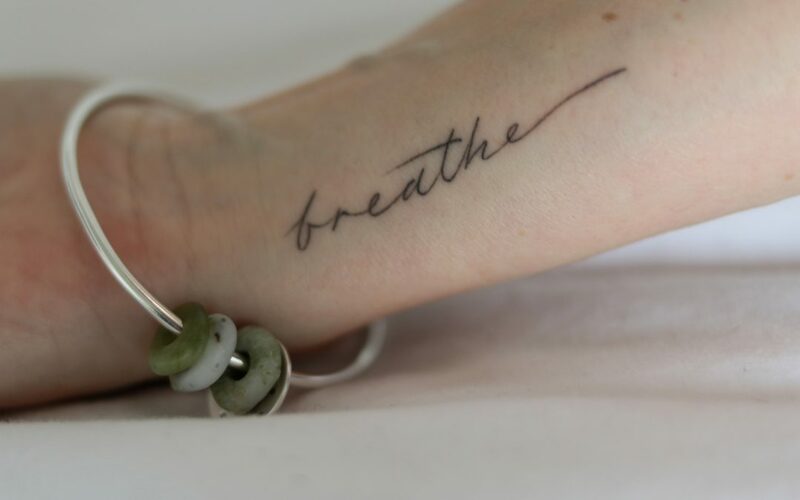 ” If I had to limit my advice on healthier living to just one tip, it would be simply to learn how to breathe correctly. Give yourself the gift of learning to breathe low and slow. Below are the steps to get started with three-part breathing, re-learning to breath from your belly, into your diaphragm and chest, like a wave. Developing three-part breathing retrains the mind and body to breath fully and deeply, low and slow. Sit in a comfortable position with the back straight and be comfortable. Option to practice this exercise lying down where you can place a book on the belly and watch it move with the breath. This also helps to strengthen your breathing muscles. Place a hand over the navel at the belly button and take a slow, deep breath into the belly. Inhale through the nose and feel the belly inflate like a balloon. Exhale, expel all the air out from the belly through the nose. Drawing your navel back towards the spine emptying the belly of air. Resist the temptation to force the breath. Place the hands on either side of the ribcage, palms of the hands against the side of the ribs and the fingers pointing inwards towards the middle of your ribcage. Feel the ribs expand with the inhale and contract with the exhale. As the diaphragm inflates, the ribs expand and as it deflates the ribs contract. Think of an accordion inflating and deflating. Practice this for five breath cycles. Place a hand below the collarbone, at the center of the chest. Inhale and feel the chest spread and as you exhale feel the chest retract. Put it all together in a wave-like motion. Inhale, the breath expands the belly like a balloon, slowly moving up into the diaphragm expanding the ribcage outwards and continues into the upper chest. On the exhale the breath moves down through the upper chest, diaphragm and then the belly deflating the balloon. Practice three-part breathing for five to ten rounds (one round is an inhale and exhale) and work towards more repetitions. When you notice that you are upset or breathing high in the chest, this is the breathing exercise to return use. If you want to live well, learn the foundations for health and wellbeing and some valuable insights I would love you to subscribe to my mailing list. You’ll receive Five – my free mindfulness e-workbook a short guide to bringing mindfulness into your morning. Take a look at Breathe to Be a guide to breathing well every day. Are you frustrated as you don’t have time to create wellbeing?